I am designing a few things at the moment with a yarn that is new to me. 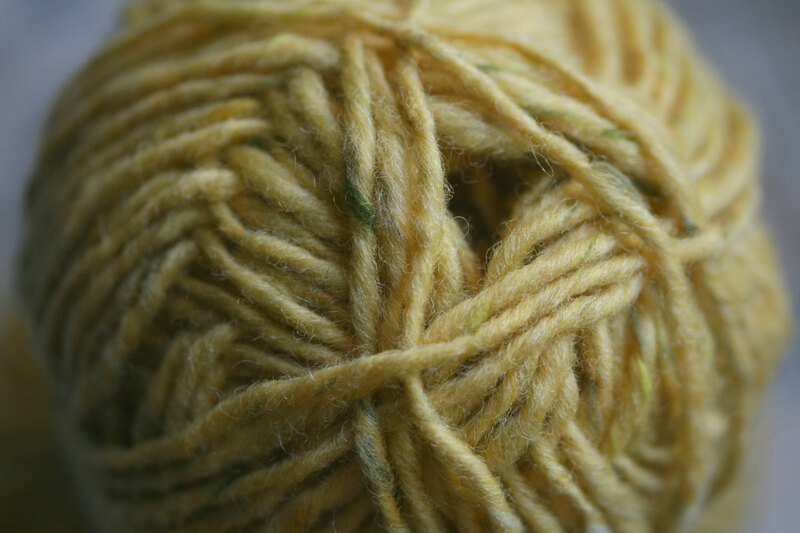 I really like this yarn – and surely the best way to find out some more about it was to visit the place where it is made? So, on Friday, Mel and I took a trip to Donegal. The yarn is a 2 ply light aran (US worsted weight) called “Soft Donegal”. 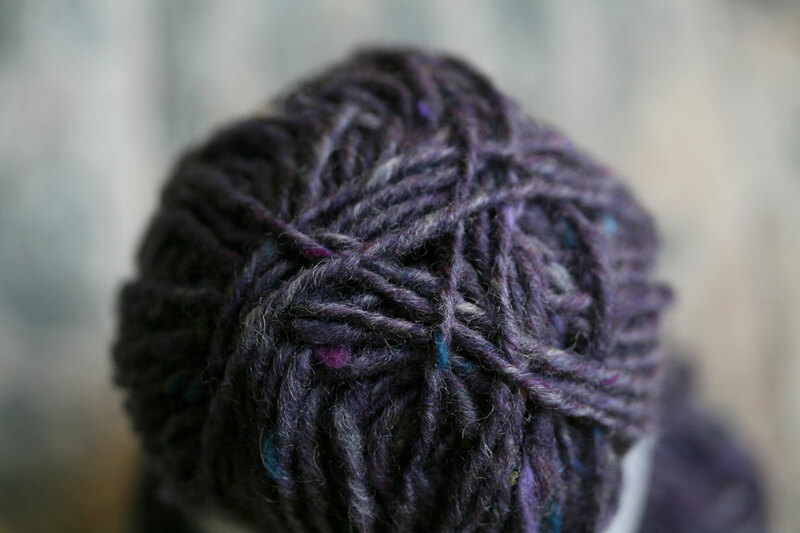 It is “soft” because its yarn base is an Australian Merino – and it is “Donegal” because it is processed with the colourful neps, burrs, or flecks that are a familiar characteristic of Donegal tweed. 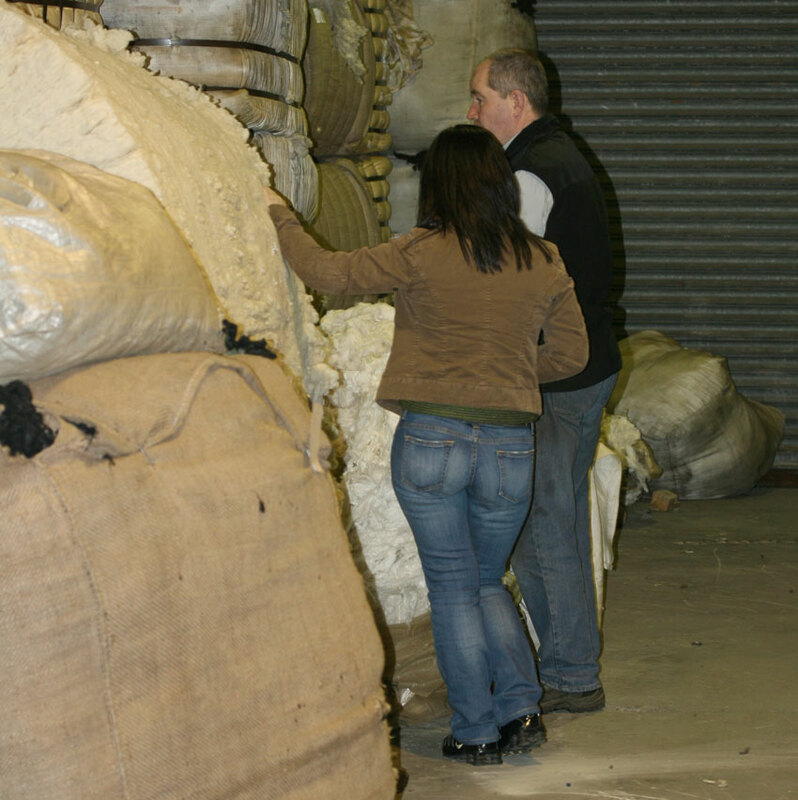 The processing and the end-product are what is traditionally “Donegal” about this yarn. 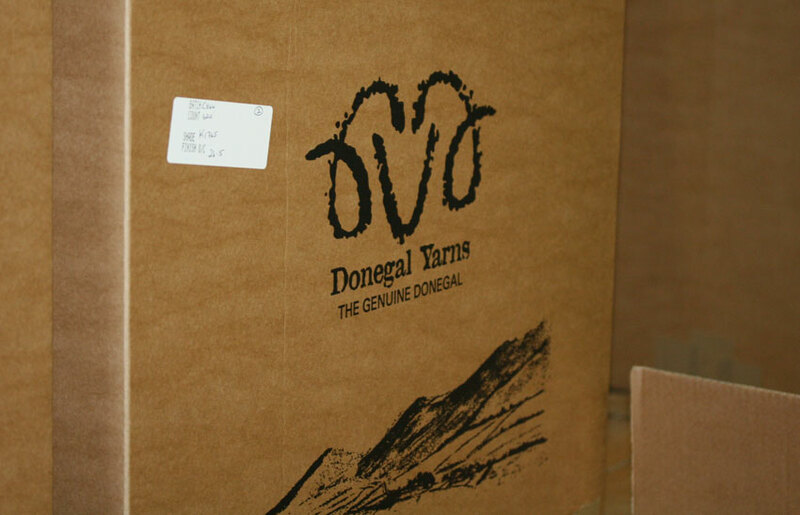 It is manufactured by Donegal Yarns, and distributed by Studio Donegal. 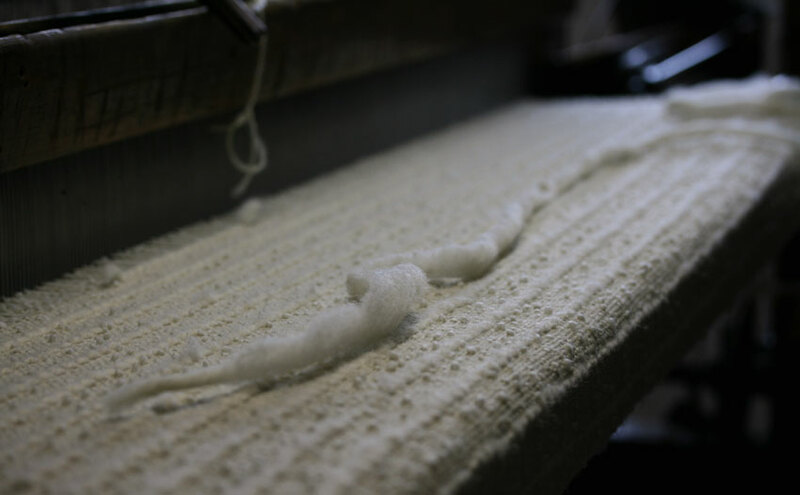 I have visited quite a few mills, but this first time I’d seen a fully vertical operation – that is, a mill where all of the processing stages from raw wool to finished yarn are effected in-house. 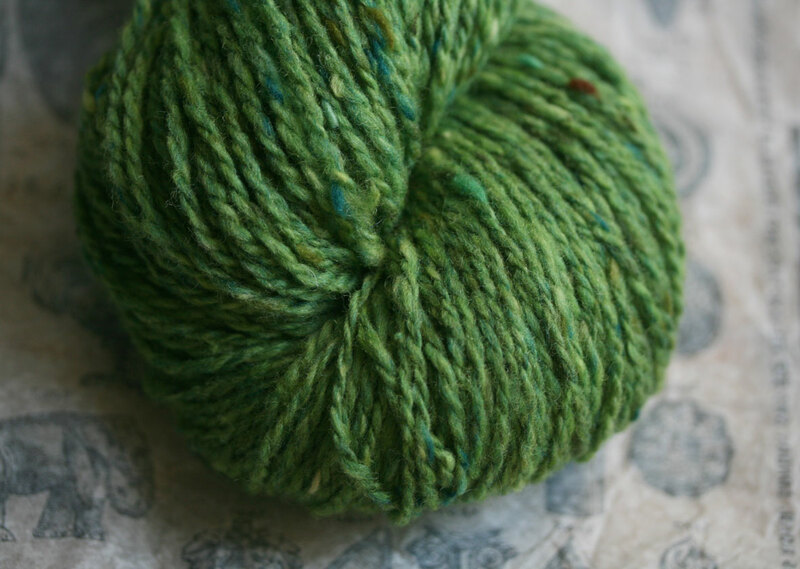 Donegal Yarns dye the wool. They mix the dyed colours into beautiful, complex shades; they add the neps (the tweedy flecks) and the wool then goes through several stages of carding and condensing before it begins to resemble what we’d call a ‘single’. 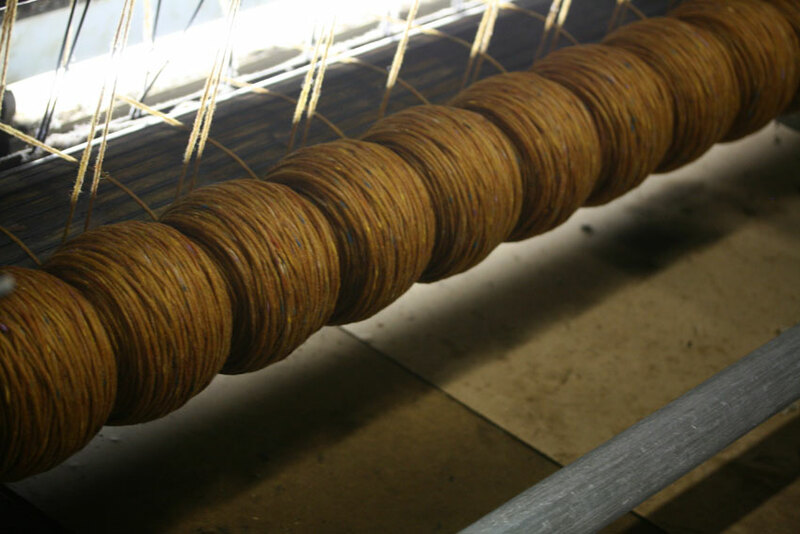 Different stages of spinning, tying, washing, drying and skeining follow before the yarn is finally ready to leave the mill as balls or cones. Thanks to Francis, the production manager at Donegal Yarns, Mel and I learned all about the operation — as well as many things we didn’t know about yarn processing. Wool shades are mixed with tweedy “neps” by being repeatedly blown about together in an amazing fleecy snowstorm . . .
. . . the Scotch Feed (invented by Henry Brown of Selkirk in 1844) puts a nifty twist into “woollen” processed yarns, turning and realigning the carded wool in preparation for the next stage. I am often stunned by the fit-for-purpose ingenuity of textile machinery and the tape condenser (invented in the 1870s) is particularly ingenious. 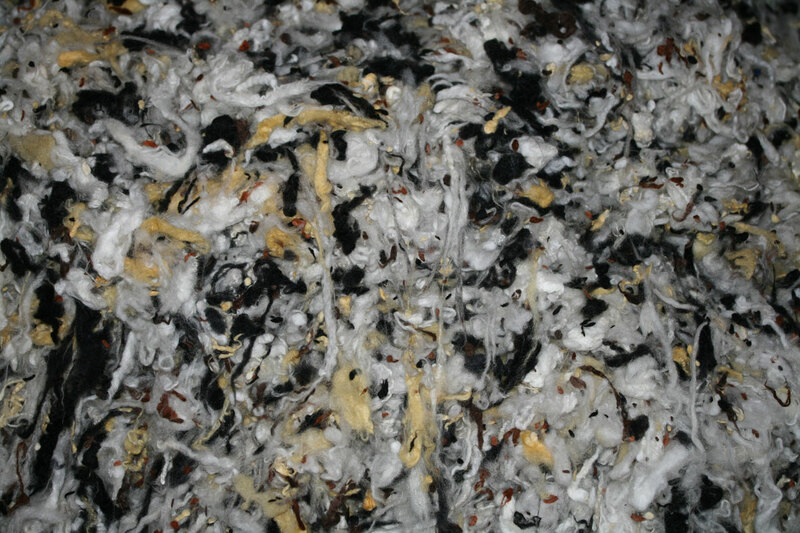 The efficient transformation of carded wool into fine ribbons relies entirely on the slightly-sticky properties of the fibres. The following day we visited Tristan Donaghy at Studio Donegal, just around the corner from the mill. 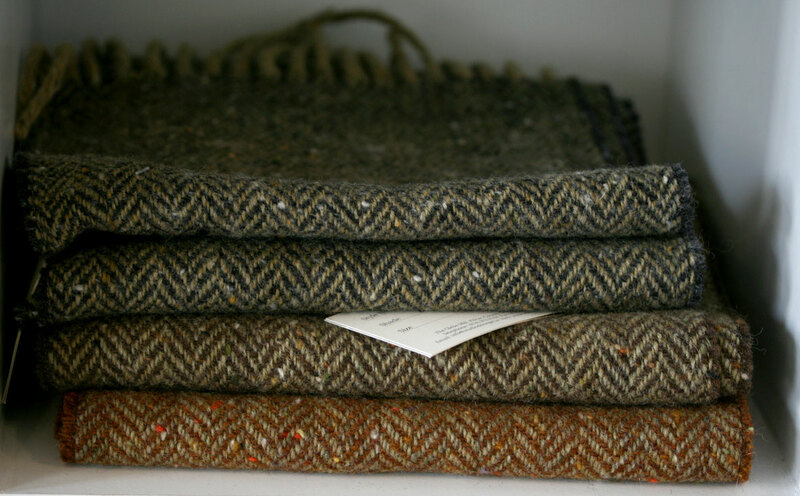 As well as distributing Donegal Yarns for hand-knitting, Tristan runs his own small and highly-skilled manufacturing operation, producing unique hand-woven cloths which are used to create beautiful home furnishing fabrics, together with a small range of clothing. What Tristan doesn’t know about Donegal tweed probably isn’t worth knowing. He was extremely generous both with his time and knowledge, and Mel and I came away feeling we had learned an enormous amount. We saw unspun sliver being woven directly into boucle fabric for a textured effect . . .
. . . we found out about leno and tuck selvedges . . .
And then we went outside to explore our surroundings, and let all we’d seen sink in. 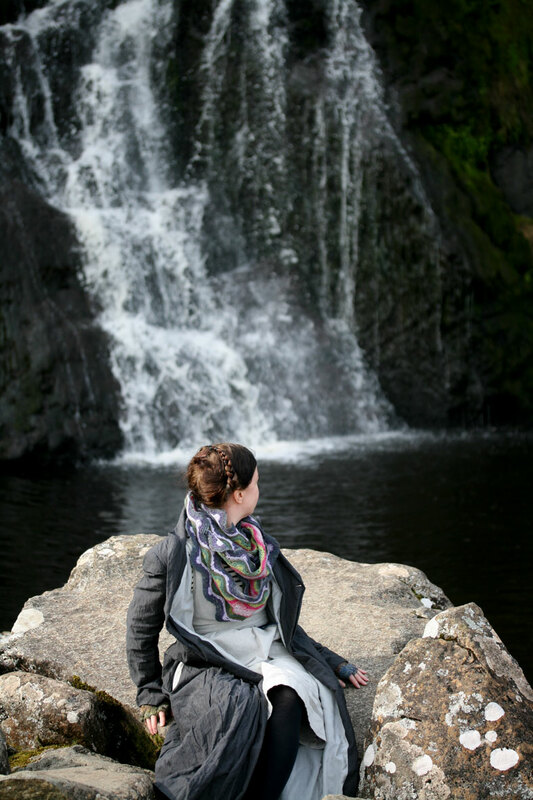 We could immediately see the material connection between the yarns and textiles we’d been admiring, and the beautiful landscape of Donegal. Such an inspiring weekend! Thankyou Chris, Francis, and Tristan! Now it is time for me to get busy with those needles. . .
* You can buy Donegal Yarns directly from Studio Donegal, or from stockists like This is Knit. What a lovely post! A real feast for the eyes. What beautiful and informative photos; really a feast for the eyes! And beautifully written up. Thanks! Thanks, Kate, for the Donegal tour! 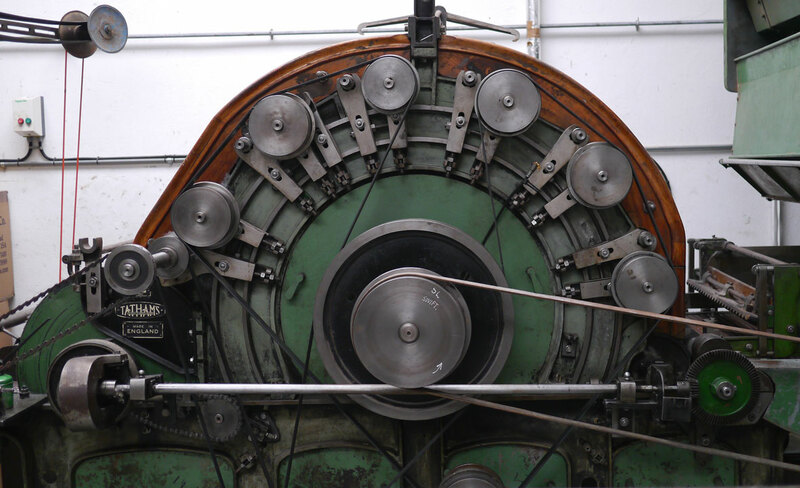 I am also fascinated by the machinery of textiles… amazing how all that used to be done by hand. I love reading your blog! Yum! So pretty there as well as interesting. I’ll never forget seeing the Woolrich wool mills in Pennselvania as a child. What a lovely and inspiring post. 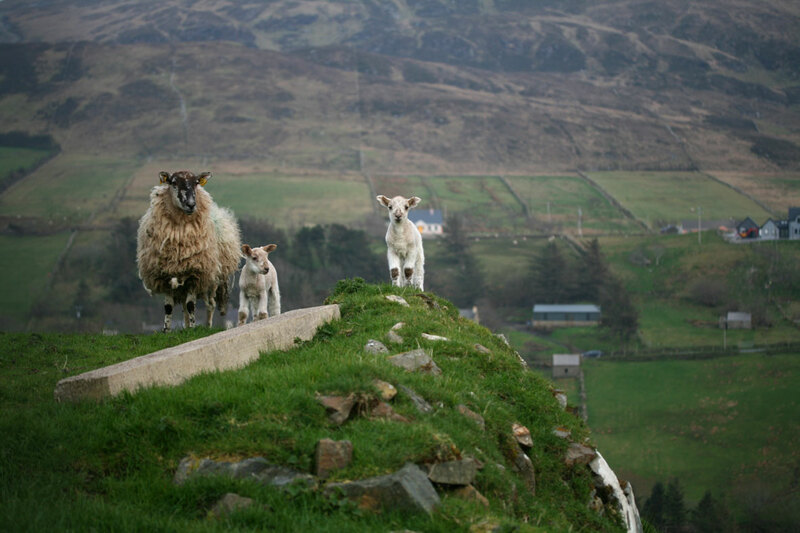 Really love the pics comparing Donegal yarns and natural colours in the landscape. What a fab tour my dear, I can almost smell the fleece! Thank you the tour, Kate. This post rates its own bookmark! Great post and I loved seeing the processing stage, we have hardly any wool processors left here in Australia, such a shame. I live near one of the major wool growing areas (the Monaro) and its crazy to think that wool grown within 50k circles the globe before it lands back in my hands! The first pic made me smile, lovely. 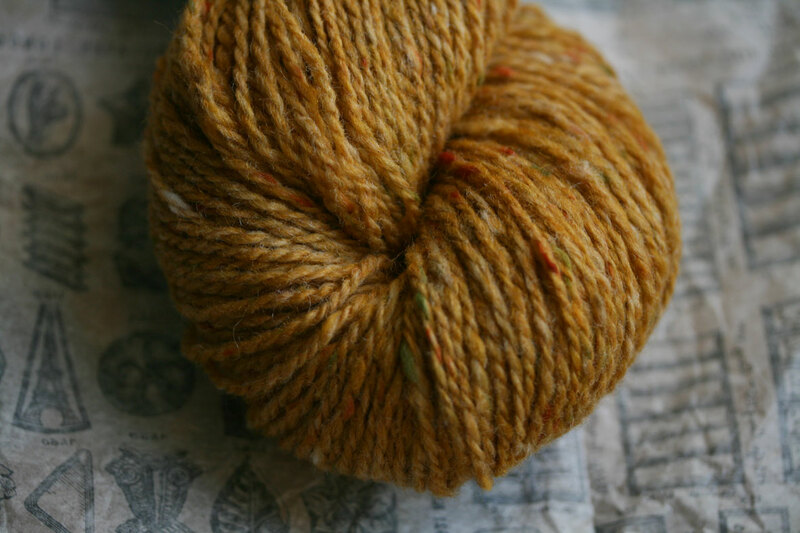 I have been in love with Donegal yarn for a long time and had no idea how it went from raw to yarn so this post was especially interesting to me. 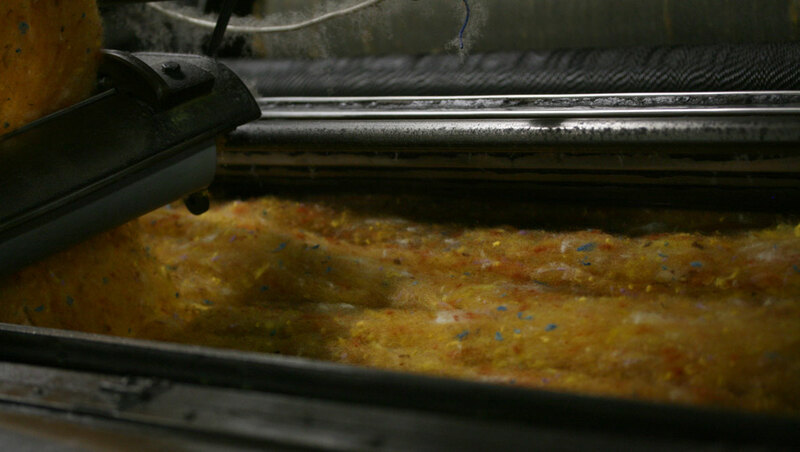 I loved the pictures of the machines slowly taking the raw material and mixing it to get just the right combination of colors for the finished product. Thank you so much for all the pictures! Hopefully I will get there one day and be able to arrange such a tour for my own knitting guild! As usual you have as they say here in the states, “knocked my socks off”. Really wonderful post. Donegal Aran is wonderful. Fabulous colours and very soft. I knitted the warriston sweater in it and it is lovely. Going to get more to knit another. Brilliant post. Beautiful photographs! As a spinner I am amazed how the the whole wool process was industralised. I can see how I remove the wool from the sheep, wash it, dye it and then spin it, but I can’t imagine how machines can do it all on a larger scale. Thanks for showing. 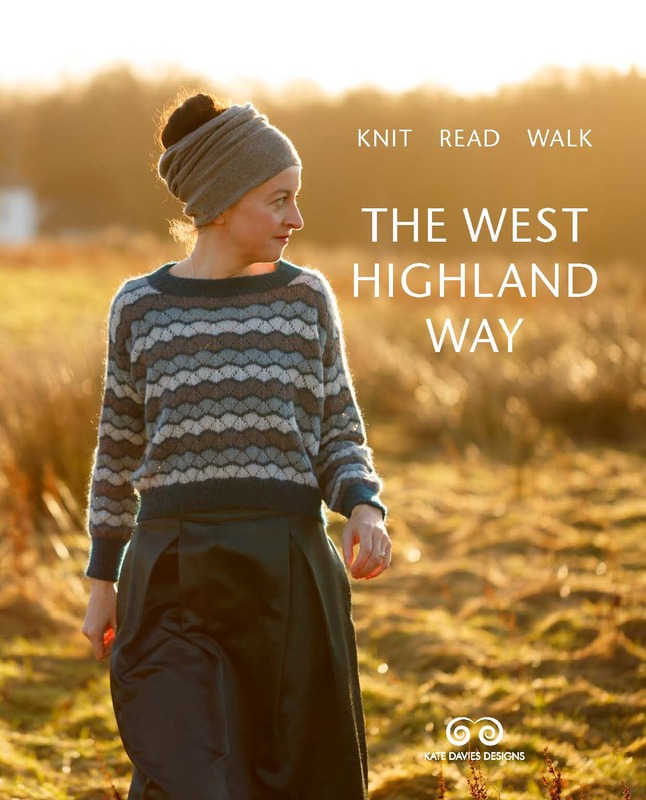 this post is so wonderful, i like so much how you connected the woolens to the land. really wonderful. I love reading your blog I love the info you give about places and people and textile related issues. I am just myself on the collar of the Warriston, hoping to finish it in time for our school trip to the marae next week, it will be perfect. While there I am going to cast on my 2nd owls for a friend, this will be the 2nd owls to go to the US. Here is a weird question, where do you buy woollen tights from? Daughter loves woollen tights and I am always looking for interesting suppliers. The pictures are beautiful!!! They make me dream! I can’t wait to visit Ireland and Scotland! :) The wool have very nice colors! Great post! 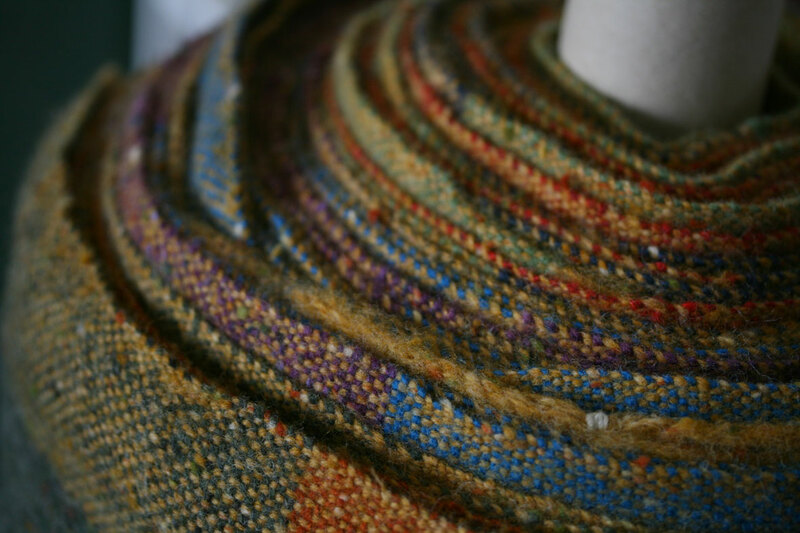 I love the connections between the colours of the wool and of the natural world. Beautiful photos and interesting as ever. The picture of you and the waterfall made me think not of Friedrich but of the Brontes. It has what a Yorkshire friend of mine would call a ‘wuthering’ look (which is a compliment!). Very interesting, and OMG the colours of those Donegal yarns and tweeds, the scarves, my very favourite type of yarns are these. Oh so beautiful, don’t know why I have always been drwn to these with the flecks and nups etc. 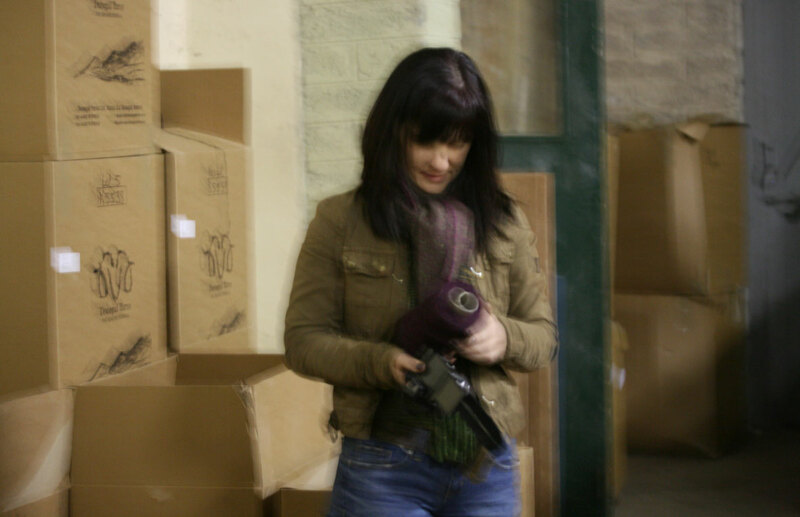 The slightly out-of-focus picture is to be expected when you are so enraptured by the process and the yarn Lol! Thank you Kate and Mel. I come from Rochdale, too, Kate! I moved away after returning from university many years ago, and have lived in a few places, but all within Lancashire, and I definitely see myself as a real ‘Lancashire Lass’ through and through – and now live in Wigan, Lancashire! LOL! Thanks so much for sharing the details of your trip – I am no longer able to travel due to ill-health and disability, so I do my ‘travelling’ through the eyes, photos and stories that other people experience wherever they traveol to, and your trip to Donegal has made a fascinating read! I admire your tenacity and determination to continue as normally as possible after your stroke! Learning to pace yourself after beoming ill/disabled is one of the most difficult things to achieve, because there are so many factors to take into account that our bodieskeep moving the goal-posts, so don’t ever beat yourself up for misjudging things and over-doing it sometimes. I’ve been trying to learn to pace myself for amost 25 years,and I still get it wrong more than I get it right, but I do have several different conditions which make it a very complex matter! LOL! Since I’ve finally got around to responding/commenting on your blog at last, and since you are a designer, I wonder if you’ve ever though about designing layering items for those of us who have to remain seated in wheelchairs? Heavier garments have a tendency to feel tight and give the look of the ‘Michelin man’ when seated in a wheelchair, so lighter/finer garments would definitely be more preferable, but I can’t find anything! I am a plus size and the garments I used to wear which were looser around the hips and/or drapey, tunic type, no longer work when I’m sitting down all the time. I have been browsing knitted and crochet designs for months, and haven’t really found any at all that I could work up without having to adapt in some way! There is a definite gap in the market! Why can’t those of us who have to use wheelchairs – an ever increasing proportion of the population as time passes, I might add – not be stylish and fashionable just because we are forced to remain seated all the time??? If I have missed something and you know of anyone who designs for wheelchair users, I would be really grateful if you were to point me in the right direction, please! If not, how do you fancy taking on the challenge sometime, perhaps? 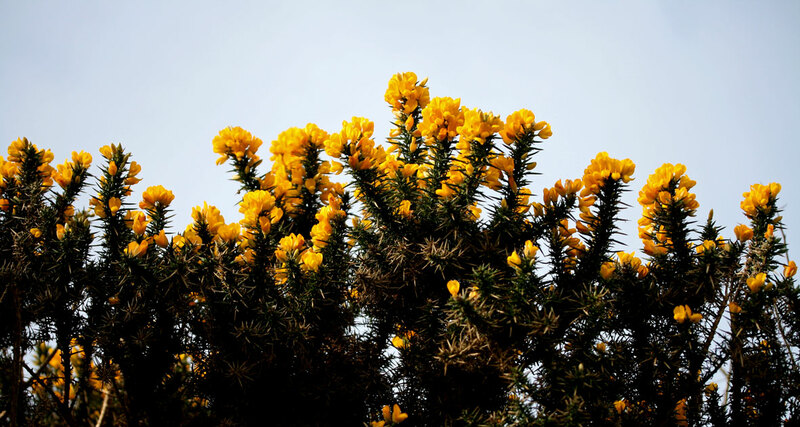 Many thanks again for sharing so much of your life through this blog – I always enjoy reading your posts, and often sympathise with your constant battle with recovery from your stroke. It’s natural to sometimes feel like you’re the only one battling, or that you are battling alone, but believe me, you are far from alone. You are an inspiration to many of us who are also fighting the fight on a daily basis. Thank you. So much beauty in this post! 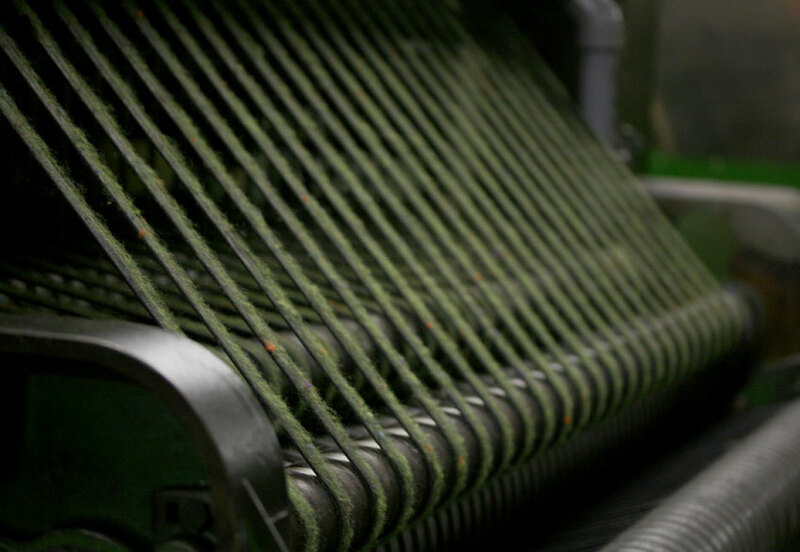 The photos of the gorgeous tweedy wool and mill equipment remind me of jared’s flood’s post last year about how shelter yarn is made. The only mill I’ve ever been to is the mini mill in Belfast – Prince Edward Island, Canada ;) I would love to visit more mills but for now, I’ll happily enjoy the virtual tours provided by yourself as well as other talented photographers and storytellers. Thank you! Beautiful account of your visit. Loved seeing your pictures & then going to their website. So much yarn & so little time! Also loved listening to the short movie about the mill & hearing the Irish. Like everyone else, can’t wait to see what you will make of their yarn. I have a wonderful load of their scarlet yarn in my stash right now. I bet they were impressed by BMC, too. Lovely pictures and beautiful yarn! Oh! I’m in love with your bmc! Is that the wool photographed in your post in February (23rd)? When much younger we made a trip to Wales and went through some of the mills there. I did a lot of weaving in those days, as well as spinning. This was a trip back in time and wonderful pictures. Thanks so much for this. 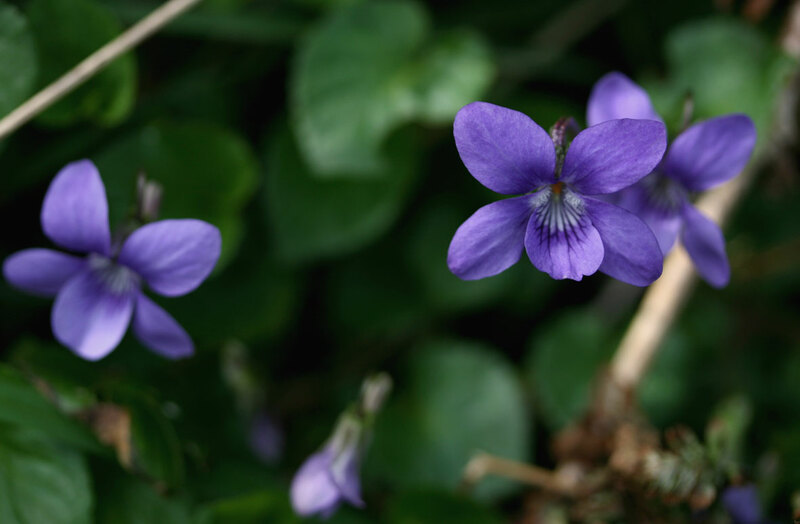 What a wonderful post – thank you so much for sharing your trip and what you learned with us! What lovely scenes. 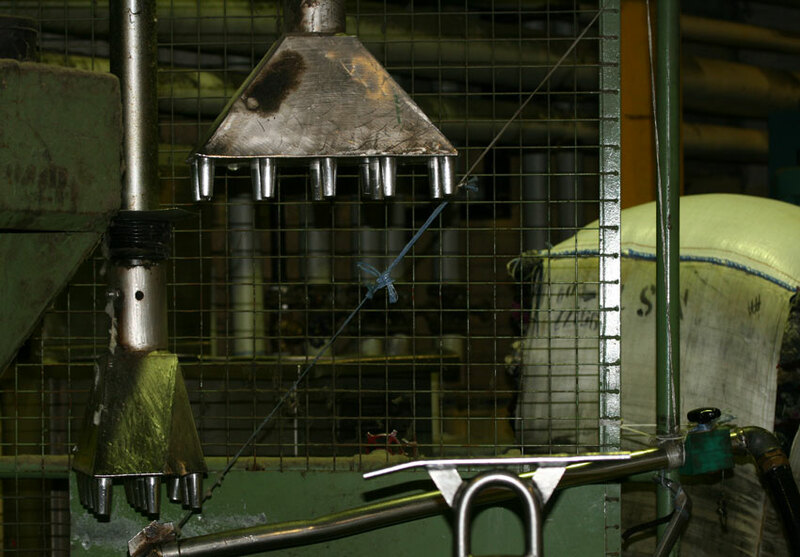 I visited Studio Donegal and the spinning mill (then called Kilcarra) not quite ten years ago and would love to return. I look forward to the results of your inspiration. ps: for knitters in the US: the yarn is sold in this country as Tahki Donegal Tweed. Thank you Gretchen! I was all set to grin-and-bear the overseas postage, but will certainly look for the Tahki yarn! I am ecstatic about this tour of Donegal Tweed which you & Mel have done and shared in your usual manner of artful intrigue. And, and it is a perfect follow-up in a sort of Tweed Series, to your Harris Tweed post of September 2009. A taste which begs more bite ~ I can’t wait to see what is on those Needles of Genius you have, and I can’t wait to see Donegal myself one day. ( My dear friend Mr. Campbell Scot lives right next door in Co.Antrim.) Okay, so , this makes me frothing-at-the-mouth for neps and woolen spinning ! Wow. 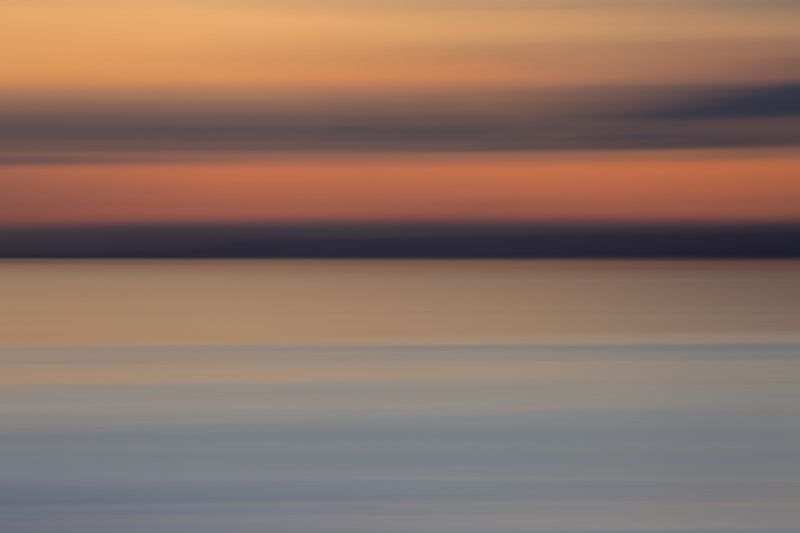 Beautiful photos and a fascinating subject. Thanks! You have such a lovely life! :) I hope you brought back plenty of yarn to play with! Oh I love the tweedy yarn, I was surprised when we went to Ireland at the lack of Irish-made yarn, especially given the number of knitwear shops. The purple one is just delicious! Thanks so much for sharing!! This is like a history lesson and the pictures are great. Perhaps if I look them up on the internet I can find a stockist in the U.S. I’m looking forward to seeing your new patterns using this beautiful wool. Wool season is beginning here now and I’m going to a small one this Saturday. There are several smaller mlls around that will process your wool if ou don’t care to yourself. Donnegal is one of my favorite places! 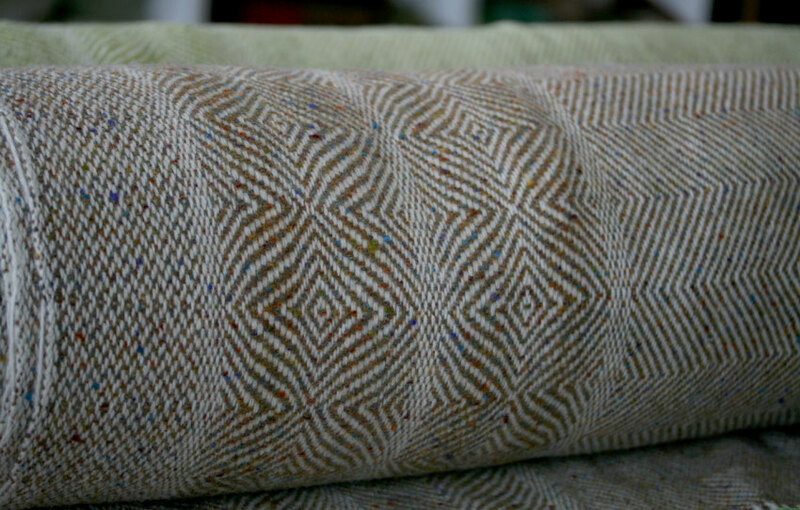 It’s so beautiful–and all those sheep… The greenish/gold tweed batt looks like some I carded and finished spinning over the weekend. Thank you for sharing, Kate. I so enjoyed reading about your visit to Donegal. My son-in-law is a wool buyer over here in Perth and buys merino raw fleece by the ton most of which is sent to China and a smaller amount to Europe. Perhaps some of it makes its way to Donegal. 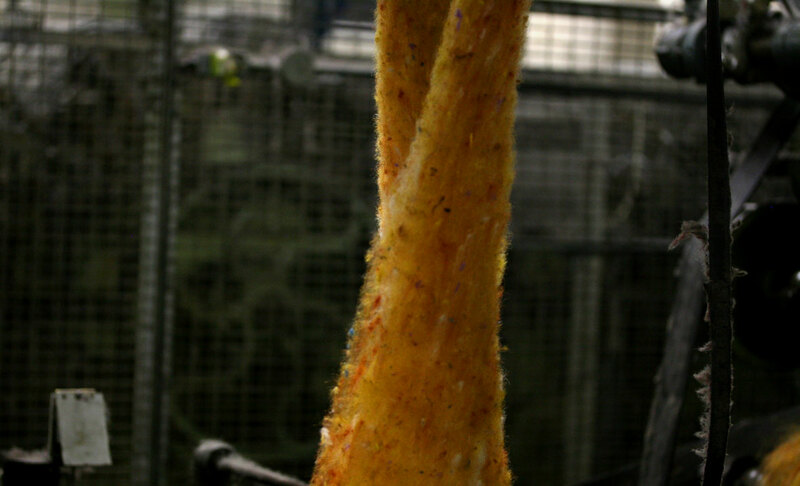 Fascinating how they make the yarn – imagine designing a machine that does all that! What a great photo at the Maghar Falls. Thank you for telling us all. Have fun with the woolly stuff. one of the things i’ve noticed about british fiber freaks is how often sizzling hot color is used apparently as an antidote to the endless rain. i have noticed in my modest efforts that sizzling hot color is much more therapeutic than the restful soft colors i need for my decor. 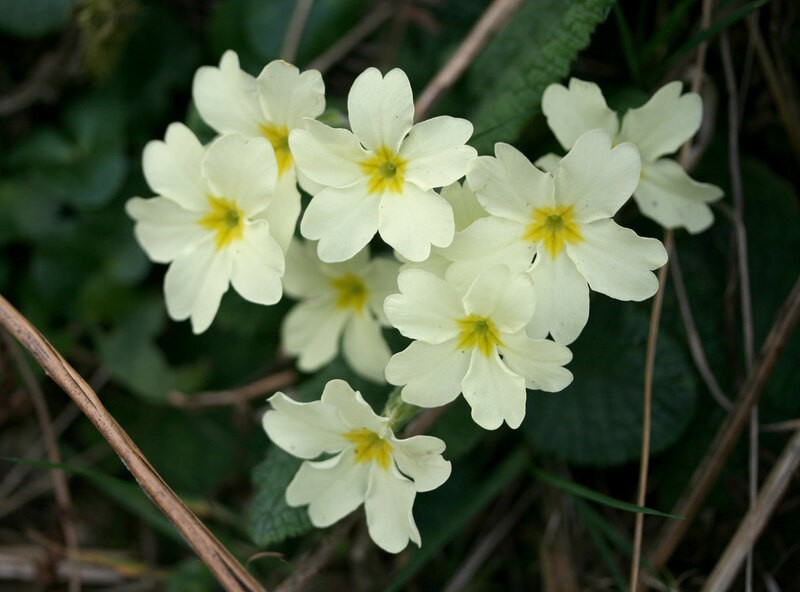 so i am very interested to see natural palettes including that sumptuous hopeful and gentle yellow, wow. What a beautiful way to start the week, opening your email, and seeing such beautiful pictures of your trip to Donegal ! It was very interesting to see the yarn process. I can’t wait to order some of the gorgeous yarn. Thanks for showing us your tour. Thank you so much for this virtual tour! Lovely, uplifting post! Thank you! Thank you for this post, so informative and such beautiful images. It makes me want to reach out to touch the yarn! 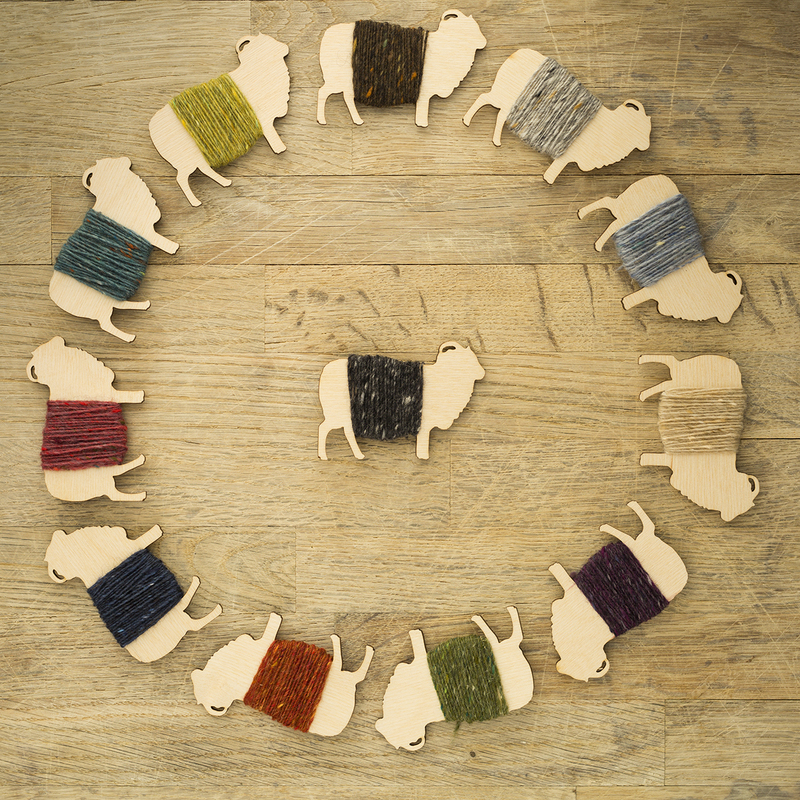 I’m very excited to hear you’re cooking up some wonders for us with Irish yarns….I can’t wait to see what is coming! I really love this company! the yarn is so warm and the colours are so brilliant! Gorgeous I love the purple yarn.